Mobogenie is Your all in one application that is avaliable on both android device and PC. If you as an android user don't or havn't come across this great application then you are in a dulling mood, wake up dudes and get what's best for you. Easy File Transfer- Did you ever wish you could carry the data in your PC on your phone? Mobogenie makes it possible! Transfer pictures, videos, music and other data between your PC and phone... all with just one click! Relieve yourself of managing the scores of texts and ads in your inbox. Or send texts to multiple contacts on a special occasion! 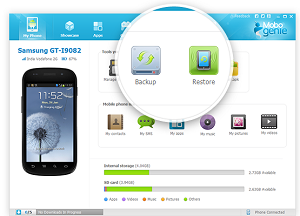 Advice:- One thing that matters is backup that is why this application is recommended for your device.